Winter Weekend 1: Ski Lodge [D6453] - $6.00 : Yarn Tree, Your wholesale source for cross stitch supplies. 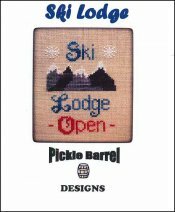 Cross stitch pattern by Pickle Barrel Designs.The ski lodge is open & ready for you to hit the slopes! Snow is falling & the peaks of the mountains are decorated with snow. Stitch count is 43 x 68.